- favorite vacation spot for divers, honeymooners - home of the donkey sanctuary and nesting site for pink flamingos. Bonaire is rich in history and natural beauty offering visitors a wide variety of sightseeing and recreational opportunities. Bonaire Marine Park hosts approximately 50,000 visitors annually. Bonaire is home to more than 500 species of colorful fish, as well as over 120 types of coral, with visibility reaching 90 to 150 feet. Its coral, reefs and marine wildlife are known world wide, making Bonaire one of the top dive locations in the world. Brochures, slide shows and videos are offered to educate visitors about the importance of protecting this natural wonder. The northern part of the island is the natural habitat of a 10 inch green parrot with yellow face and shoulders known as the Bonairean Lora. With fewer than 400 in existance, these birds are rare and are protected by law. Built in 1639, Fort Orange is a small structure south of town along the coast. This fort was originally a government center and depot. A wooden tower was built in 1837 and replaced by the present day stone lighthouse in 1932. Current renovation plans will allow the City Hall to be housed within the Fort in the near future. With over 300 kms of unpaved roads on the island, Mountain Biking is a wonderful way to see the unspoiled beauty of Bonaire. Bike rentals are available on the island. Bonaire is one of the few nesting sites in the world for pink flamingos. Behind the salt lakes on the south end of the island you can see the nestling ground of the flamingos, which you may also see in large numbers at the salt pans. Along the southern portion of Bonaire you will see salt pans which shine in colors ranging from pink and brown to purple. The color is caused by high salinity that causes bacteria. Pekelmeer is a salt water lake where solar salt is produced though a crystalization process and then exported to the Eastern United States and other Caribbean islands. The salt pans shield the 135 acre flamingo sanctuary which is home to an estimated 40,000 birds. The Northern tour of the island goes to Gotomeer, where hundreds of flamingoes are usually sighted. Then on to the scenic area of Two Wells and Bonaire's oldest village, Rincon. Arawak Indian wall-paintings can be found just past Rincon on a small side road. Seru Largu offers a spectacular view of the sea. 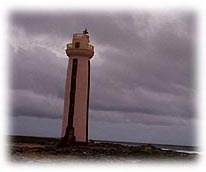 Along the southern scenic tour you may see the Trans World Radio antennae tower, the white hills of salt from the salt pans, stone huts at Rode Pan built in 1850 to shelter slaves, the Willemstoren lighthouse built in 1837, and three 30 foot obelisks built to guide the salt ships into land in 1838. Sorobon Beach and Boca Cai at Lac Bay are two of the island's most beautiful areas. The road back to Kralendijk leads through the village of Nikiboko where refreshments are available. This 13,500 acre game preserve occupies most of the north western portion of the island. The park is open 8 AM until 5 PM daily, except holidays. Admission is $5.00 per person, only $1.00 per child under 15. No hunting, fishing, camping or dogs are allowed. Tours of the park are available.